A 17-year-old has died of his wounds after bringing explosives to an office of Russia's FSB federal security service in the north-western city of Arkhangelsk, officials say. Three FSB employees were hurt when the explosives blew up just inside the building at around 09:00 (06:00 GMT). The blast caused serious damage. A CCTV image of the suspect appeared on social media soon afterwards, along with a message he allegedly sent just before the blast. Although the authenticity of the message posted on an anarchist chat group has not been confirmed, the user identifies himself as an anarcho-communist and claims the FSB "fabricates cases and tortures people". 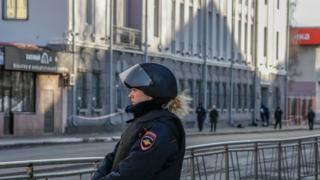 Russia's anti-terrorism committee said, according to initial findings, the suspect was a 17-year-old local resident who had gone into the building and pulled out of his bag an "unidentified object that exploded in his hands". The blast was described as a terrorist attack. Governor Igor Orlov said local authorities in Arkhangelsk, around 1,200km (750 miles) north of Moscow, had taken measures to heighten security in all public buildings. Attacks on security services are unusual in Russia, although police have been targeted in parts of the Caucasus, including Chechnya and Dagestan. The FSB has been behind two controversial cases this year, against groups accused of plotting violent uprisings, the BBC's Sarah Rainsford reports from Moscow. In both, human rights groups argued the claims were false, while they said statements in one case were extracted under torture. Asia Bibi was sentenced to death in 2010 after she was accused of insulting the Prophet M uhammad.